If you're wondering how to set up multi-room audio, it's easier than you think. 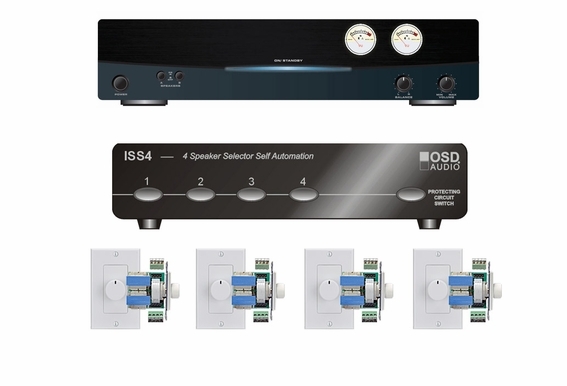 This 4-zone audio system from OSD Audio lets you separately control music in 4 different rooms, and the audio quality is pristine and beautiful. With this multi-room stereo system, all you'll need to do is select the best speakers for each room and run the wires. Outdoor Speaker Depot is your premiere source for home entertainment systems and audiophile audio systems, and we're here to answer any questions you have. When you choose your speakers, keep these simple rules in mind. For rooms that are 150 square feet or less, 5.25-inch speakers are a good size. Select 6.5-inch speakers for rooms that are 200 square feet and larger, and 8-inch speakers for rooms that are bigger than 400 square feet. As for speaker style, Contractor and Custom series speakers are good for background music. For stronger bass and louder sound, see our High Definition series. The Kevlar series speakers have the best overall sound that's ideal for a home theater and audiophile tastes. In the Trimless series, the speakers are designed to blend into your de´cor. This multi-room audio system will allow you to control 4 zones in your home with ease. This simple system has everything you need to setup your multi-room audio. All you need is to pick out your speakers. Kit comes included with (1) ISS4 speaker selector, (1) AMP200 amplifier, and (4) SVC100 volume controls. Hi David: The 4 Zone Audio System will work with the single Echo connected to the AMP then driving a four zone speaker selector with an Impedance matching Volume Control connected to a stereo pair of speakers. Here was your first statement; "My goal is to connect an echo to the amp and be able not only wake up the amp but to voice activated the turning on music, change songs and adjust volume." The amp would be set on auto sensing so when the voice activation will turn on the echo sending a signal to the amp turning it on. The Echo will be able to change the music and control the volume. The volume controls are passive devices that only turn down the music level established by the Echo. That is as far as you can go with this setup. You can not control different zones without adding a dedicated Echo per zone. You would also need a dedicated amp per room/zone so that you play the speakers in that respective area. I am not sure whether you are starting from scratch or working with an existing system. I believe you could purchase our XMP100 for each Echo and connect the speakers in that room/zone with a local amp and Echo. I think you could issue voice commands in one room (with the Echo) and control the other three rooms/zones with the Echos communicating with each other. The XMP100 would be set to auto-sensing and come on when its room/zone received a turn on command from the first Echo. I also think you can now do the same with the Chromecast Audio as well, using commands through your cell phone. Hi.. I have 3 zones, Living Room, Bedroom and Patio 14 speakers total, all cables were run to a single location, I don't have Speakers controls on each room.. This System will work or what do you recommend? My house came with cat-5 and speaker wires ran to 5 locations in my home. I’m looking for a system that can run this set up. What do I need? Is the cat-5 wire used for a bus system? I’m not totally sure what a bus is, but I believe it is used to control volume and inputs in each room. Regardless, one set is outdoor and I won’t be using that. So I need a 4 zone set up with speakers. Please help. I just asked a question about the inputs and how many it has. I have a CD player and an iPod, and satellite radio but that is all I have. No receiver. Will this set up still work for me? Do I just run each unit directly to the amps input? how many inputs are on this amplifier? I want to hook up a cd player and satellite radio to it. Possible an AM/FM radio as well. Will this unit work for that? hi, could this type of system be added to an existing proficient audio whole home M4 system ? Can an Amazon echo/echo dot be used to control this multi-room kit via Bluetooth/Wifi? can all 4 zones be used simultaneously? I want all of my speakers to get both stereo channels, so I plan to use the amp200 in bridged mode. Do I run the bridged speaker pair (2 wires) from the amp to either of the channel connectors on the selector, and then to one side (channel) of the volume control? In other words, do i simply treat the bridged connection coming out of the amp as though it were the right channel at the selector and volume and then leave the left channel unused? I have a receiver that has a 2nd zone output. Can I run that output into the input of your unit and then connect speakers to 3 separate rooms. I realize the source would be the same for all 3 rooms. What is the wiring configuration for the volume controls? Can I hook this up from the "Speaker B" outputs on my receiver? Yes you can use the Speaker B output from your receiver connecting it to the High Level (speaker) input of the AMP200. It would be better if you have a signal level (or RCA) output from your receiver (if available) and connect to the Input #2 of the AMP200.The low level connection is typically a cleaner signal. The AMP200 also features an A & B speaker output. In both cases the AMP200 features a second source option as well. Also: You can purchase just the Speaker Selector and connect that to the B output of your receiver. In this case you will want to make sure you enable the protection circuit of the Speaker selector so as not to over lowed your receiver. Can Apple AirPlay be used to control the system? I have a restaurant with 4 zones, and I am presently running 4 amps with 2 speakers attached, with volume control to each speaker. Could I use your system and double the volume controls to get the same capability? Hi Tamara, This package pretty much covers everything but the speakers and the wire! This is good for up to 4 pairs of speakers. So the Amp runs to the speaker selector, the speaker selector has 4 zones, each of which will run to 1 of the 4 volume controls and then each volume control will be wired to a pair of speakers (2 speakers). For outdoor are you planning on running in-ceiling speakers or exterior, wall mounted speakers? If I buy this setup are there outdoor speakers that are 8 ohm that can handle 125 RMS watts each? I'm having problems finding some. Thanks. I purchased the ICE 610 ceiling speakers and slide volume controls for 4 zones. Is this a compatible system? I'm buying a new house and there are several a/v options. 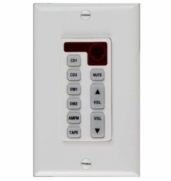 How could I integrate this system so I can have multi room audio from zone 2 on my receiver while minimizing my cost to prewire each room? Where would the amp and selector by placed and how could i select one room or all at once? I think I'm ready to purchase this bundle, but am a total noob when it comes to home theaters / multi-room setup. Ideally, I want to control my 5.1 system with a detached amp and separately power 4-zones independent (or concurrent) with same audio as the 5.1 system. Below is a short list for reference: •	5.1 – family room •	Zone 1 – kitchen (mono) •	Zone 2 – living room (mono) •	Zone 3 – patio (stereo) •	Zone 4 – backyard (stereo) I’ll do my best to summarize my thoughts: •	Line-in 1 = iphone dock •	Line-in 2 = 5.1 stereo speaker system •	Each zone will have separate volume controls •	Using the speaker selector (or volume controls), can I: o Watch TV in family room and play music to all zones? o Play music in all 5 locations? o	Play tv in all 5 locations? Again, I apologize for my silly request, but I need a detailed response and/or wiring diagram for the above requested setup. Thanks to all in advance for you assistance! I am trying to put together a whole house audio system. I currently have an old Carver Receiver with 130 watts/channel, a Sonos Connect (no amp), an old pair of Infinity bookshelf speakers (8 ohm) and a pair of Bose wall mount speakers (4 ohm). At the moment, the plan is for 4 zones though one of them may end up dedicated to a subwoofer. My dilemma is: should I hang on to the Carver and use it with an impedance matching speaker selector (with or without volume control?) or purchase a multi-zone amplifier. I have been considering a 12 channel amp from Dayton (would install volume controls for each zone). This 4 room kit provides yet another option. how many speakers can run be run per zone?? Is the output mono or stereo to each room (one or two channels)?